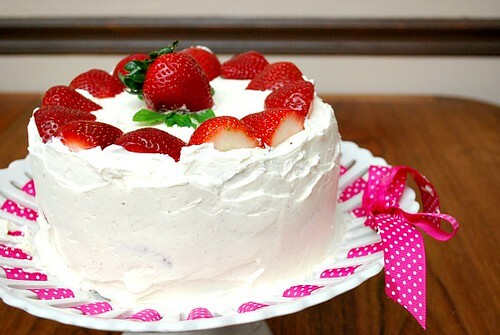 The original strawberry cream cake recipe was made using a yellow cake. I substituted the yellow cake for chocolate for a twist. I've coveted the original recipe for awhile but never got around to making it. Even though I can't attest to how it would have tasted using regular all purpose flour, I can say that the gluten free version I made below was pretty awesome. I love how there was a bit of fresh strawberries in every bite, along with the light and fluffy sweet whipped cream that had a touch of cream cheese for extra richness. So here's to another year... and I'm sure it will be a delicious one! increase the baking time slightly). In a large bowl combine the sugar with flour, sifted cocoa powder, baking powder, baking soda and salt; mix until combined.Add in eggs, cooled coffee, buttermilk or milk, vanilla and oil; mix using an electric mixer at medium speed beat until smooth. Add in the water/coffee mixture and beat for another 2 minutes (batter will be quite thin). Divide mixture evenly between the two cake pans. Bake for about 30-35 minutes or until cake tests done (the baking time will vary depending on what size of pan you use), or until toothpick inserted comes out clean. Remove from oven and allow to cool in pans for 3-5 minutes before removing and cooling on a wire rack. Halve 24 of the best looking berries and reserve. Pick berries that are uniform in size, if possible. Chop up the the remaining berries; toss with the strawberry preserves and let sit for 1 hour, stirring occasionally. Strain juices from berries and set aside until cake is cooled. When cake is cooled, place cream cheese, sugar, vanilla and salt in bowl of standing mixer fitted with whisk attachment. Whisk at medium high speed until light and fluffy for about 1-2 minutes, scraping down bowl as needed. Reduce speed to low and add heavy cream in a slow steady stream. When almost fully combined, increase speed to medium high and beat until mixture holds stiff peaks, 2 to 3 minutes more. You should have a total of about 4 1/2 cups of the cream mixture when finished. Place bottom layer on cake plate or cardboard round and spread 1/2 cup frosting over the top layer of cake. 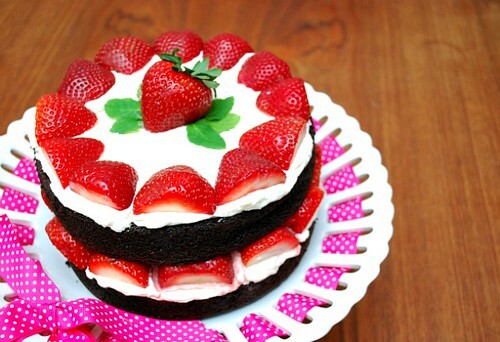 Arrange a ring of 20 strawberry halves, cut sides down and stem ends facing out, around perimeter of cake layer. Top with the other cake layer and gently press down (whipped cream layer should become flush with cake edge).. Spread another 1/2 cup frosting over the top layer of cake. Arrange a ring of 20 strawberry halves, cut sides down and stem ends facing out, around perimeter of cake layer. Spread remaining whipped cream on the sides of the cake. Garnish with a whole strawberry and fresh mint leaves. Serve, or chill for up to 4 hours. This looks fabulous. I love the pretty pink against the dark chocolate color. Great pick for your birthday! Happy Birthday Joelen! What a beautiful cake! 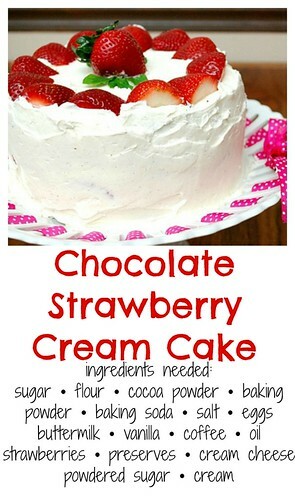 I must try this delicious recipe!! Thanks for sharing with us. Strawberries, chocolate and whipped cream sounds like the best birthday present one could ask for.